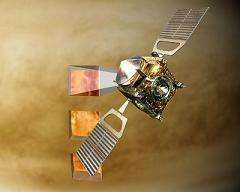 (PhysOrg.com) -- ESA’s Venus Express spacecraft has observed an eerie glow in the night-time atmosphere of Venus. This infrared light comes from nitric oxide and is showing scientists that the atmosphere of Earth’s nearest neighbour is a temperamental place of high winds and turbulence. Unfortunately, the glow on Venus cannot be seen with the naked eye because it occurs at the invisible wavelengths of infrared. ESA’s Venus Express, however, is equipped with the Visible and Infrared Thermal Imaging Spectrometer (VIRTIS) instrument, which can see these wavelengths. VIRTIS has made two unambiguous detections of the so-called nightglow for nitric oxide at Venus. This is the first time such infrared detections have been made for any planet and provide a new insight into Venus’s atmosphere. “The nightglow can give us a lot of information,” says Antonio García Muñoz, who was at the Australian National University when the research was carried out; he is now located at the Instituto de Astrofísica de Canarias, Tenerife, Spain. "It can provide details about the temperature, wind direction, composition and chemistry of an atmosphere." The nightglow is ultimately caused by the Sun’s ultraviolet light, which streams into a planet’s atmosphere and breaks the molecules up into atoms and other simpler molecules. The free atoms may recombine again and, in specific cases, the resulting molecule is endowed with some extra energy that is subsequently lost in the form of light. On the day-side of the planet, any atoms that do find their way back together are outshone by the sunlight falling into the atmosphere. But on the night-side, where atoms are transported by a vigorous diurnal circulation, the glow can be seen with appropriate instruments, such as VIRTIS. 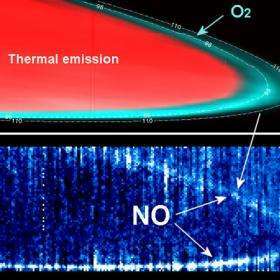 A nitric oxide nightglow in the infrared has never been observed in the atmospheres of Mars or Earth, although we know that the necessary nitric oxide molecules are present because they have been observed in ultraviolet. The nightglow on Venus has been seen at infrared wavelengths before, betraying oxygen molecules and the hydroxyl radical, but this is the first detection of nitric oxide at those wavelengths. It offers data about the atmosphere of Venus that lies above the cloud tops at around 70 km. The oxygen and hydroxyl emissions come from 90-100 km, whereas the nitric oxide comes from 110-120 km altitude. Yet, even VIRTIS cannot see the nitric oxide nightglow all the time because it is often just too faint. “Luckily for us, Venus has a temperamental atmosphere,” says García Muñoz, “Packets of oxygen and nitrogen atoms are blown around.” Sometimes these become dense enough to boost the brightness of the nightglow, making it visible to VIRTIS. Venus Express can observe the three nightglow emissions simultaneously, and this gives rise to a mystery. The nightglows from the different molecules do not necessarily happen together. “Perhaps when we have more observations, we will understand the correlation between them,” says García Muñoz. In order to do that, the VIRTIS team plans to continue monitoring the planet, building up a database of this fascinating phenomenon. More information: 'The near-infrared nitric oxide nightglow in the upper atmosphere of Venus' by A. García Muñoz, F. P. Mills, G. Piccioni, and P. Drossart is published in the Proceedings of the National Academy of Science Journal, on 27 January 2009.